History | Matsuwaka Glass and Pearl Works Corporation. The history of imitation pearls of Izumi City dates back to glass lampwork beads known as “Senshu Beads”. During the early Meiji Period, the Country of Izumi produced religious artifacts using glass beads such as prayer beads, bead screens, and hair accessories. The products were carried along the Yodo River by riverboats travelling from Tenman of Osaka to the station port Fushimi, and then to Kyoto where they were traded by religious artifact wholesalers. 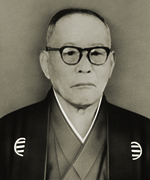 In 1887, Teizo Matsuwaka, the founder of Matsuwaka Glass and Pearl Works began producing prayer beads as well as accessory purpose Negake Beads and Kago Beads. 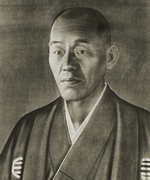 He showcased colored glass beads named as Izumi Beads in the Third National Industrial Exhibition of 1895, and then Hari Beads in the Kansai Product Exhibition of 1909, the latter of which won the Silver Prize. 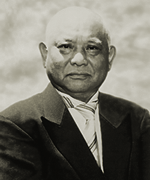 While devoting himself to research and manufacturing of glass beads, the entrepreneur never neglected the importance of marketing his products; owing to him, Izumi Beads was successfully popularized as accessory pieces appreciated by ordinary people. The establishment of glass beads as the local industry of today's Izumi City is surely an achievement that can be accounted to Founder Teizo Matsuwaka. Once into the Taisho Period, a new technique of coating glass beads with the scales of largehead hairtails began attracting attention. Always eager to explore the novelty, Teizo begins producing imitation pearls in 1920 to lead the way. Since then, he continued to work with his son, Kenzo in pursuing this process while also serving the community as a city counselor. The monument erected by the prominent people of the city in recognition of Sadazo's contributions still stands with dignity in the vicinity of the company’s headquarters. In 1921, the company starts eyeing foreign countries as potential markets. Matsuwaka launches the Cherry Brand, a line-up of accessories adorning imitation pearls named after the Japanese cherry blossoms for overseas marketing. Despite the suspension due to the Pacific War, American bound exports continued until all the way into the early 1990's, establishing a widespread presence among Americans. Second generation owner Kenzo Matsuwaka resumes business immediately upon the end of the war. In 1950, the company restructured itself as the Matsuwaka Glass and Pearl Works Corporation. With the Osaka International Exhibition as the starter, the company showcased its products in accessory exhibitions in New York, Frankfurt, and Hong Kong. 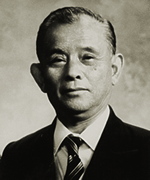 By the time the third generation owner Hisao took on full-scale management, the company had stepped up to a certified member of companies contributing to the development of Japan through export. The degree of the company's contribution to industrial promotion and regional development can be seen through the list of awards granted, including the Industrial Contributor Award awarded by the Osaka Prefecture, the Medal of Honour with Blue Ribbon, and the Gold and Silver Rays Class of the Order of the Sacred Treasure. In 1985, fourth generation owner Masami receives the baton at the centennial anniversary of the company. After succeeding the business in the year 2012, the fifth generation owner Yohei Matsuwaka started afresh to re-establish the traditional craftsmanship of Izumi at a global standard. Given the modern world where fashion takes various forms, we are committed to pursue novel techniques and trends while also preserving the deeply rooted traditions that our products represent. 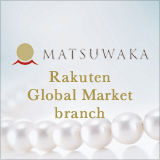 The challenge of Matsuwaka Glass and Pearl Works to penetrate every corner of not only Japan but also the world with trustworthy, quality products is an ongoing endeavor into the future. Despite the period of silence, we received encouraging words from an overseas customer who used to be a regular, that the family has cherished the Chery Brand products that they own, and strongly hope for the revival of the brand. 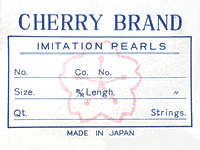 To our surprise, Cherry Brand had been surviving on its own in the United States while the company was busy focusing on the domestic market. Items that were once stored away as deadstock had been dug out, triggering a phenomenon that appears like a quiet buzz. Given this happy surprise, both our employees and craftsmen started to re-examine Cherry Brand with hope. We are currently making progress towards resuming overseas exports. Cherry Brand is about to make a revival at the global era where humans, things, and events interact across the globe. Our hope is for the brand to blossom into a flower that is beloved and respected by as many people as possible, reminiscent of the way cherry blossoms beautifully bloom on centuries-old cherry trees each and every spring.